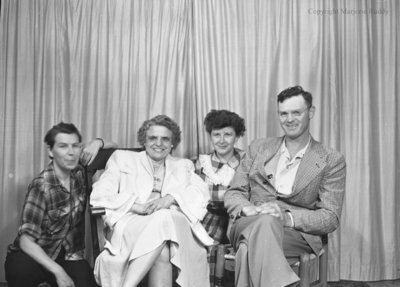 A black and white large format negative of Norah Morrissey and relatives. In this view two people are kneeling and two people are sitting down. Honorah (Norah) Mary Beamish was born at Burritts Rapids, Ontario on October 11, 1913. She married Nicholas James Morrissey in Whitby, Ontario on October 4, 1940. She died on December 16, 1957 and is buried in St. John's Roman Catholic Cemetery, Whitby, Ontario. Norah Morrissey & Relatives, August 1950, Marjorie Ruddy. Whitby Archives A2013_040_318.